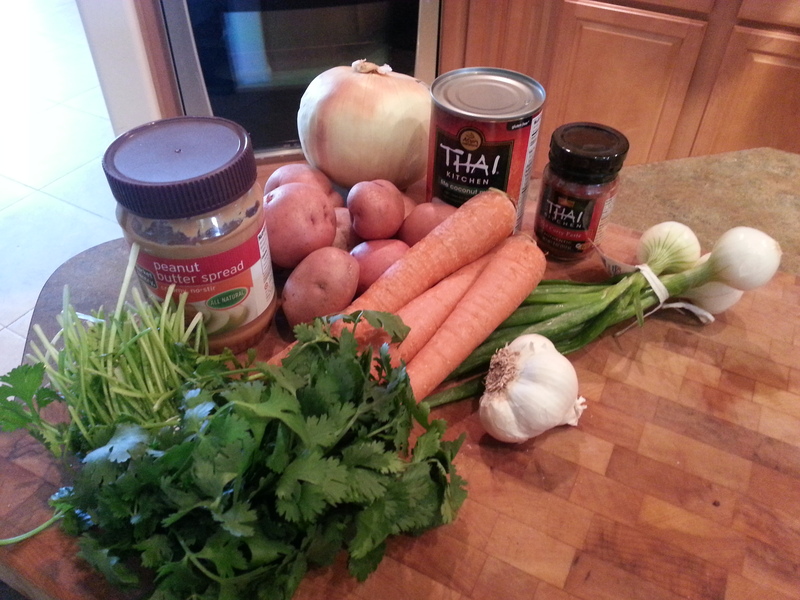 You are here: Home / Everyday Posts / Thai Chicken Curry — Slow-Cooker and Figure Friendly! Don’t like ethnic food? Don’t like Crock Pots? This post is not for you. I LIVE for curries. Thai, Indian, I don’t care. Flavorful? Oui. Spicy? Only spicy enough to knock my socks off. The more habañero, the better! I don’t have enough recipes which call for habañero peppers, though. This is why I depend on my totally not-neighbors to the far east. I can put together a mean curry-in-a-hurry on the stove top, for sure. But that recipe takes some attention and is not very healthful–still I indulge, because I cannot stay away from curry for more than a week. But this recipe is delicious, spicy, and uses up only about 1/3 of my daily Weight Watchers points (without the rice, that costs extra). This recipe is not kid-friendly. It’s spicy. But my kids’ bland palates are not the boss of me, and it satisfies my craving for Thai and my craving for Thai is definitely the boss of me. Wait no longer. 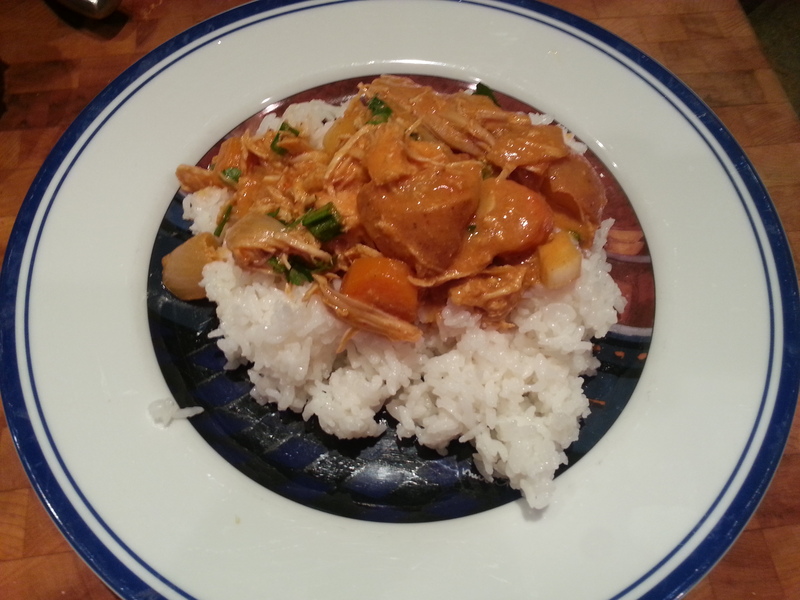 Here, I give you Thai red curry chicken in a slow cooker. a couple handfuls of small red potatoes, or medium/large sized potatoes sliced in half. Enough to fill the bottom of your crock. Whisk together in a bowl the can of lite coconut milk and about half the jar of curry paste. Don’t forget to use a “Crock Pot condom”–or what the Reynolds company more blandly calls “slow cooker liners“. 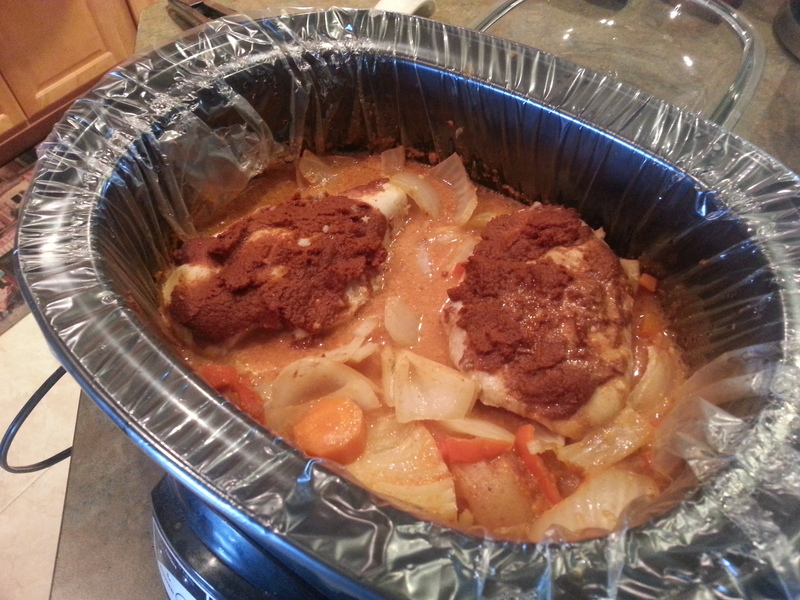 Place the potatoes, onion, red bell pepper, carrots and garlic on the bottom of the slow cooker. Pour coconut milk mixture over the veggies. Place raw chicken breasts on top of veggies, and use a small spatula or spoon to scoop out the remaining curry paste and coat the top of the chicken breasts with it as evenly as you can. Add a sprinkle of kosher salt if you want to eventually die of heart disease, or skip this step if you trust me. Towards the end of cooking, use metal tongs to shred the chicken within the crock (this should be easy–the chicken should shred itself if you even just glare at it at this point). Just before serving, add sliced green onion and pulled cilantro leaves to the crock, toss to coat, and re-cover for a few minutes. Serve over rice (I prefer jasmine or basmati). *I added a few tablespoons of peanut butter to the recipe when I made it. I am not afraid of the taste of peanut butter outside of a sandwich so this seemed like an okay idea at the time. It turns out that the mixture tasted better without the peanut butter. 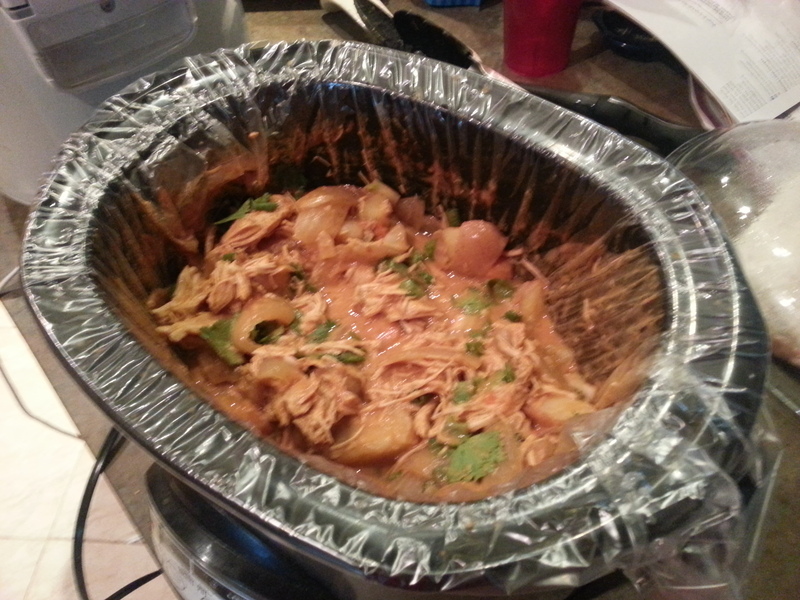 It was still delicious, but the pb turned the dish into something else–heavier, more savory–but not what I wanted. If you want to go this route, add the pb with 30-60 minutes to go in the cooking process and mix/whisk well, and plan to agree with me that you shouldn’t have done this at all.